Keep the fashion blues away when you put on this stylish teal color short sleeve walking suit by Montique. If you know style and appreciate dressing well no matter what the occasion, you'll need yourself a short sleeve walking suit that is designed to make you look your very best. 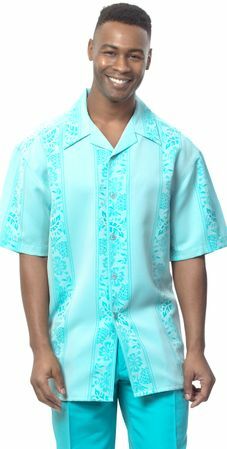 This bold teal with embroidered walking suit features solid color pleated baggy pants and is made of all Poly for easy care and wrinkle resistance.